Red golden tabular rock crystals from Arkansas are rare. 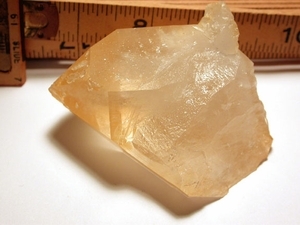 The only place they were found, along with the pale champagne and golden golden healers, was the Collier Creek Mine - and so even with a conchoidal fracture to one face of 1/4"x 1/2", we are very pleased to offer this one. Etherially translucent it's 2-1/4"x 1-1/2"x 3" high. With a flume of veils, uncommon stepped isis main face, growth craters and regrowth, raised record keepers, rainbows and glitter crystals, a very unusual crystal [at a great price].